First, if you go to Amsterdam you must see the train station at night. It has nothing to do with chocolate but the twinkling lights on the rooftop against the amazing architecture are breathtaking. 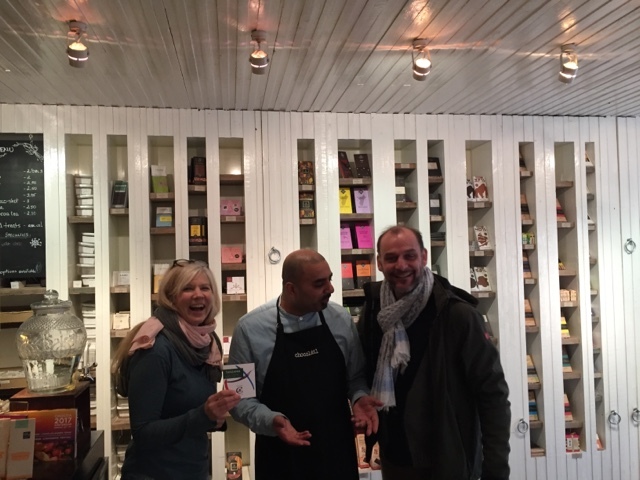 The first chocolate shop I found in Amsterdam was Chocolatl, if you are a serious craft chocolate enthusiast don't miss this one. The owner, is a fantastic resource, probably the most knowledgeable shop owner I've found on my travels. He is truly passionate about the topic and we could have talked all day. The selection of craft chocolate is amazing. I came back twice and left with many of the craft chocolate bars from makers in Europe that I've never seen in the USA. When you visit you must also try a choco shot, rich and thick liquid drinking chocolate. The next shop I tried was Urban Cacao. 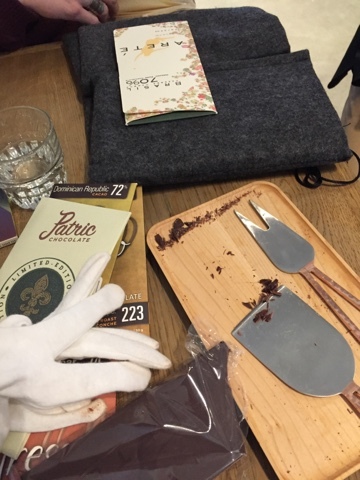 This shop is geared toward those who like sweet chocolate and trendy inclusion/additions to their chocolate. They sell confections and have a very large selection of bars sporting everything from mint to raspberry to lavender which I find quite unusual for a bean to bar maker. Their graphics show cacao beans drying, empty bags of cacao are positioned as props, and I was told by the employees that this is a bean to bar operation, I only saw tempering machines and equipment for making confections at this location. Before I go next time I'll request a tour of their bean to bar facility. The drinking chocolate was sweet and frothed in a high powered blender (I do love chocolate foam). 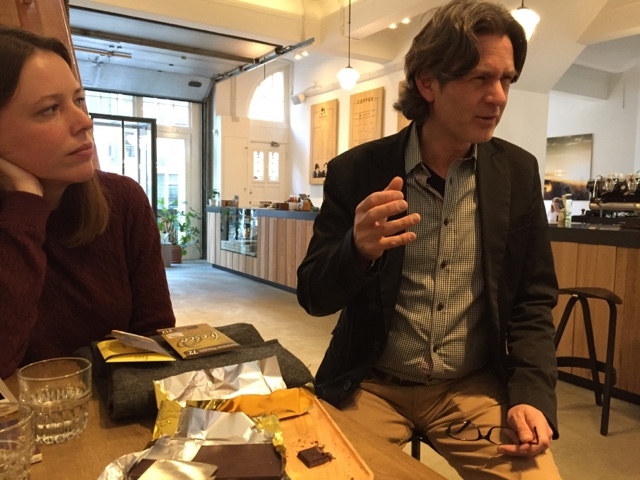 I spent part of an afternoon with The Highfive Company an importer and European distributor of specifically American craft bean to bar chocolate. They operate online and don't have a retail location so Dennis van Essen, the proprietor, suggested we meet at Bocca Coffee Roasters. 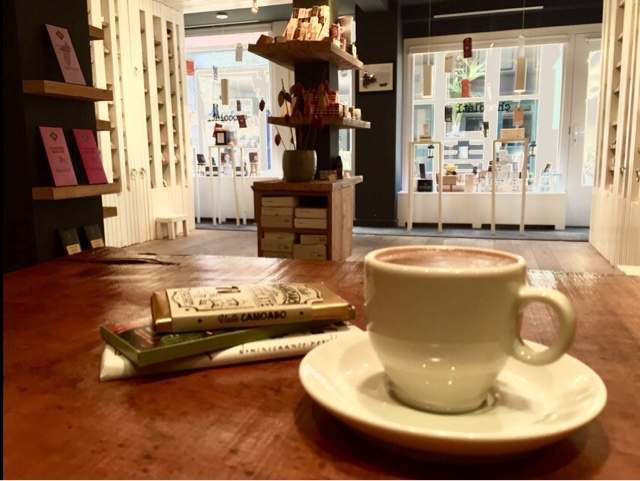 We tasted and talked chocolate while sipping drinking chocolate. Bocca is serious about their coffee and their drinking chocolate as well. Watching the barista make the drinking chocolate and finish it with art in the foam similar to that we typically see in a latte was a treat. Dennis brought along Hilde and Viola, two charming chocolate loving ladies. 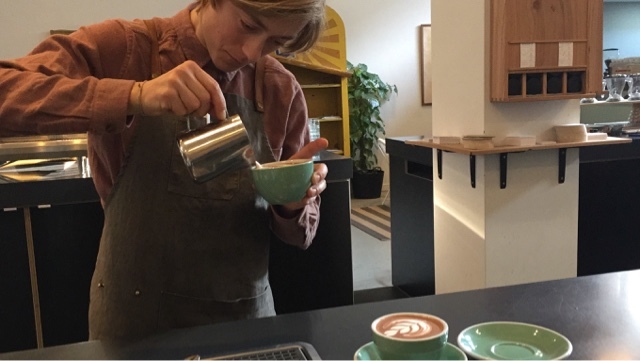 Hilde works with Dennis at Highfive, ( if you are close to their shops watch for events and tastings). Viola is in charge of chocolate at Bocca Coffee Roasters . Although I was exhausted from traveling we had a great time tasting and talking chocolate. 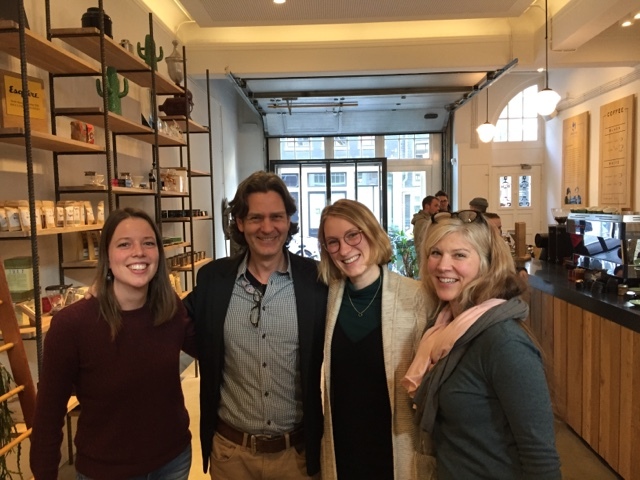 It was fantastic to meet with people who are just as enthusiastic about craft chocolate as I am. My only regret is that I left too quickly without picking up one of the chocolate bars Bocca carries sourced from Australian cacao. 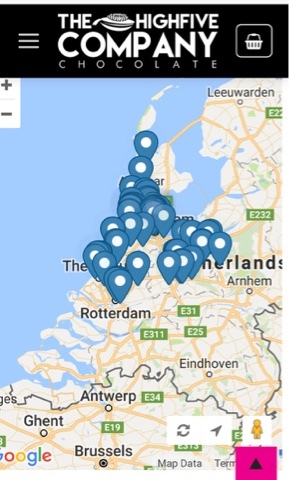 The one resource I wish I had found before I went to Europe is the store locator map of the places The Highfive Company distributes craft chocolate. Where there is American craft chocolate, I'm sure that there will be more fine, craft, bean to bar chocolate. Next time I travel I'll study this map in advance for the locations that I will need to visit. No adventure is complete without an unanswered question. Why was this giant ball of foil rolling down the street? Next I'll start tasting all of the bars I brought back from Amsterdam. Stay tuned for more chocolate adventures.